Representative Jeff Perry recorded an interview yesterday with MassBeacon.com, a new political website. Perry joined what MassBeacon.com calls the Sacred Codcast. Perry is the second House Republican to participate. Click here to hear the interview with Perry. The Massachusetts House of Representatives today unanimously adopted a bipartisan amendment that if signed into law would provide greater protection to minors. While taking up An Act Punishing Assault and Battery by Means of a Bodily Substance upon Correction Facility Employees, House Minority Leader Brad Jones and Judiciary Committee Chairman Representative Eugene O’Flaherty offered the amendment with the support of dozens of co-sponsors. It was offered in response to the Supreme Judicial Court’s ruling made on February 5th. The SJC ruled in favor of a child predator who had been sending sexually explicit content through online communications. The amendment will expand the statute by prohibiting the dissemination of harmful material to a minor via instant messaging or other online communications. Members in the Republican Caucus filed legislation a couple weeks ago because they were concerned that the state’s statute under which the defendant was convicted had not been updated to reflect society’s current electronic age. After an examination of the statute and its legislative history, the Court stated that the Legislature must take action if it wanted to ensure that our children are protected from predators seeking to electronically disseminate obscene material to minors. The Republican Caucus is pleased this proposal garnered such support and applaud members on both sides of the aisle for acting swiftly on this very important issue. The Patrick-Murray Administration’s former Secretary of Labor and Workforce Development took an indirect shot at the administration yesterday, questioning why more jobs haven’t been created. Suzanne Bump, who is now running for State Auditor, yesterday said according to State House News Service that “the public has a right to ask why we aren’t getting better results given the multiple agencies allegedly committed to the task of creating jobs.” While we agree with her, we hope she’s ready for the backlash and ridicule she’s about to get from Governor Patrick’s sidekick and political piranha Tim Murray. Apparently Bump didn’t get the memo from Patrick and Murray who aren’t fond of being criticized! It would seem to us that Bump, a former Patrick-Murray Administration insider, is supporting our notion that this administration’s effort to create jobs is lackluster. We’ve said it before, but we don’t mind saying it again; Governor Patrick and Lieutenant Governor Murray are constantly two steps behind in producing any meaningful reform or policy change. Recently, Patrick released a so called jobs bill – but the timing alone makes us question his commitment to the people of the Commonwealth and his ability to appropriately serve as the state’s CEO. The Governor’s latest election-year ploy is perhaps the most transparent action he’s ever taken and that’s only because he’s faced with being out of a job at the end of the year! As you may recall, last August a portion of the Credit Card Accountability Responsibility and Disclosure Act went into effect. Today, the second round of changes is going into effect that according to the Office of Consumer Affairs and Business Regulations will give consumers significantly more information regarding their accounts than ever before. OCABR says this second round largely focuses on three areas: notice and billing for consumers, consumer protective rules on payments and restrictions on marketing to college students and younger adults. For more on the new regulations taking effect, please click here. While some progress has been made on some fronts there is still plenty to criticize whether it’s policies, process or personalities. First of all, let’s call a spade a spade. The ethics bill we passed last year was nothing more than a public relations spectacle, a poor attempt at damage control if you will. This bill was a reaction to one Democrat misdeed after another - three Speakers in a row had been indicted and two Senators had resigned in shame. After ethics reform, we grabbed the low hanging fruit in pension reform with the belief that we’d be tackling the more complex issues later on. However, since the passing of this mediocre bill the only action we’ve seen is from Governor Patrick and the bill he filed was in response to a gubernatorial opponent’s plan. Bi-partisan transportation reform with the promise to save billions if administered wisely (a big if with the Patrick Administration) is probably the biggest claim to fame. But let’s face it...the Democrats on Beacon Hill needed to do transportation reform or else they wouldn’t have been able to pass their huge tax increase. And finally, the Legislature took a crack at a good education reform bill…but only when hundreds of millions of dollars were being dangled as incentive. Here’s a question…why no action to help the economy and create jobs? The Legislature has done virtually nothing to stimulate the economy and generate job creation. We have yet to take up a meaningful piece of legislation that would put out of work Bay Staters back to work. Our caucus offered a slate of bills at the beginning of the legislative session that would have done just that – unfortunately many of them are stuck in various committees. Why haven't we eliminated the bogus Suffolk County Holidays? What about passing a municipal relief package to aid struggling cities and towns? When talking about missed opportunities this legislative session, the list goes on and on and on! So if you are comfortable with those who would try to convince you the glass is half full by all means defend the Legislature. But if you think you deserve more and better - criticize away. She is absolutely right! The Democrats on Beacon Hill shouldn’t worry at all. In fact, they should continue doing exactly what they’re doing because the people of the Commonwealth are so pleased with everything they’ve done in the last year – especially the tax increases. We can just hear the chants come election season as crowds of Democratic supporters demand more tax hikes! Representative Story must be right! Republicans apparently didn’t take back the Governor’s mansions in Virginia or New Jersey last November. (Wink wink!) And it was all a dream – Scott Brown wasn’t elected U.S. Senator from the bluest of blue states. (Nod nod!) She is absolutely right. The people want more of the same, more politics as usual and the status quo! Memo to Representative Story – if you honestly believe what you’re saying, we’d like to talk with you about a bridge we might have for sale! 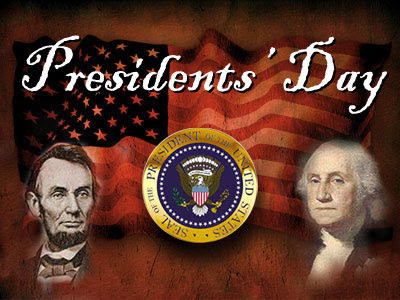 From all of us here at The Capitol View, we hope you will join us in observing Presidents' Day. Two of our nation's president, George Washington and Abraham Lincoln, were born this month and today we recognize them and all of their accomplishments. We thank them for their service to our country and for making the United States of America the great nation it is today. State House News Service is reporting that Mayor/Representative William Lantigua will be stepping down from his seat in the House. While we are glad Mayor/Representative Lantigua is finally showing good judgment, we are disappointed it took him this long to make the right decision. It is obvious the City of Lawrence needs state intervention. However, all of the negative attention surrounding the newly-elected Mayor has made it hard for the people of the Commonwealth and the colleagues of Mayor/Representative Lantigua to take the request for state assistance seriously. While these new circumstances will help the City of Lawrence’s cause in the Legislature, much work still needs to be done on this bill to make it palatable. We here at The Capitol View maintain that an independent finance control board needs to be put into place immediately before the city is allowed to borrow $35 million. Without a control board, the bill will not garner any bipartisan support. It looks like Treasurer Tim Cahill has a case of Do as I say, Not as I do! As you know by now, many people have been criticizing Mayor/Rep. William Lantigua of Lawrence for receiving two taxpayer-funded salaries at the same time. One of those critics was Tim Cahill who the other day called Lantigua’s behavior “piggish.” Well, it appears as if the Treasurer has also been a bit piggish in the past! Apparently using Cahill’s logic, it’s ok for him to double-dip but not Lantigua. Yet another Massachusetts Democrat not practicing what they preach! BOSTON—House Minority Leader Bradley H. Jones, Jr. issued the following statement today in response to Governor Patrick’s recently filed Job Creation Bill. I welcome today’s filing by the Patrick/Murray Administration relative to job creation for small businesses. While there is much to commend in the filing it is regrettable that it took the possibility of losing their jobs for the Administration to start caring about those that have already lost their jobs over the past many months. The Administration’s long overdue bill does contain some good ideas including one I filed as legislation at the beginning of the current legislative session. House Bill 2789, An Act Relative to Stimulating the Economy through Job Creation would allow a tax credit for small businesses that create at least 5 new direct jobs in the Commonwealth. The credit is equal to 25% of the salary attributable to the increase of jobs multiplied by Massachusetts personal income tax rate. That bill had a public hearing last July and no further action has been taken. The UI rate freeze is one they should have embraced months ago and was a part of a more comprehensive UI piece Republicans filed in January of 2009. This legislation is long overdue - not only are we deep into this recession, but even Capitol Hill has already passed one job bill. While the success of that bill is debatable, at least lawmakers in Washington, DC are acting like they are interested in putting people back to work. It took plummeting polling numbers to act instead of rising unemployment rates to inspire action on the part of this Administration. While this overdue bill will be cold comfort for thousands we can only hope that it will provide relief to others who are hanging on by a thread. As you know from multiple media reports, the city of Lawrence is facing a dire fiscal crisis and is in need of state assistance in order to balance the city’s FY2010 budget. While we here at The Capitol View would like to help every city or town in need, we understand Lawrence is in a situation that requires our immediate attention and swift action. The city of Lawrence has an overwhelming fiscal shortfall and needs a definitive state plan to regain stability. We will not hand the city of Lawrence a blank check but we certainly want to see the city succeed. Unfortunately, the current legislation falls short and will not provide long term relief to the ailing city. Today, a joint hearing of the House and Senate Ways and Means Committees was held to discuss House Bill 4421 which was filed by the Patrick-Murray Administration and would allow the city of Lawrence to borrow $35 million. The weak framework provided in the bill will delay the implementation of a Fiscal Control Board in Lawrence for another year, wasting unnecessary time. We will not support this bill unless an independent finance control board is put into place immediately. Given the decision of newly elected Mayor and State Representative William Lantigua to collect two public salaries despite the financial disaster in his hometown, the taxpayers of the Commonwealth deserve a legislative plan that protects their investment. Governor Patrick and Lieutenant Governor Murray dropped the ball in its handling of this legislation by not demanding Mayor/Rep. Lantigua to either resign from his State Representative position or at the very least give up one of his two taxpayer funded salaries. Along with holding two positions at the same time, Mayor/Rep. Lantigua’s bad press is making it harder for his colleagues to support the legislation. Mayor/Rep. Lantigua needs to be wearing one and only one hat right now – and that is being a committed full time mayor. There’s no doubt that Lawrence needs state intervention and maybe Mayor/Rep. Lantigua can save the sinking ship, but it will require his full commitment and attention to do so. House Minority Leader Bradley H. Jones, Jr. today announced his intention to file legislation that would provide greater protection to minors. An Act to Prohibit the Electronic Transmission of Harmful Material to Minors was drafted in response to the Supreme Judicial Court’s ruling last Friday. The SJC ruled in favor of a child predator who had been sending sexually explicit content through online communications. The legislation would expand the statute by prohibiting the dissemination of harmful material to a minor via instant messaging or other online communications. Representative Jones said he was particularly concerned that the state’s statute under which the defendant was convicted had not been updated to reflect society’s current electronic age. Representative Jones invited his colleagues to co-sponsor the legislation. So far, more than a dozen legislators have signed on to the bill. Today is an exciting day for Republicans across the Commonwealth as the first Republican to hold a U.S. Senate seat in Massachusetts in four decades will be sworn in today. U.S. Senator Scott Brown, formerly a State Senator ran an unbelievable campaign, working hard from the early hours in the morning until the late hours in the evening. As he takes the oath as our next U.S. Senator, all of us here at The Capitol View want to extend our sincerest congratulations to Scott. While we will miss him on Beacon Hill we know he will be fighting hard for all of us on Capitol Hill. The date for the special election to fill the State Senate seat formerly held by Scott Brown has been announced. The primary is scheduled for April 13th and the general will be held on May 11th. These dates coincide with the election to fill the State Senate seat left vacant by the resignation of former Senator Anthony Gallucio of Cambridge. The winners of these two elections will have to run for the seat again come November. It’s kind of a slow news day, so we thought we’d do something a little different today on The Capitol View- take a trip down transportation memory lane! As you may recall, the Republican Caucus was extremely critical of Governor Patrick’s decision to appoint Jim Aloisi Transportation Secretary. Aloisi recently resigned from the post and it’s a good thing, because his mere presence was toxic. While at the Executive Office of Transportation and the Massachusetts Turnpike Authority, Aloisi was a key architect of the Central Artery/ Third Harbor Tunnel project. And make no mistake about it, Aloisi, a Patrick-Murray appointee was the author of the funding scheme that is now crippling our state’s finances. Aloisi even told reporters shortly after his appointment that while serving as a lawyer to the Massachusetts Turnpike Authority, "It wasn't my job to tell people the truth." Perfect fit for the Patrick-Murray Administration! Those are some examples of his incompetency prior to being appointed Transportation Secretary. Here’s a recap of all of his mishaps while serving in the Patrick-Murray Administration. • Failed to adequately monitor the Massachusetts Turnpike Authority’s fast lane contractor resulting in 113,940 Fast Lane overcharges last year, for a total of $190,441 in improperly tolled charges against turnpike motorists. • Ordered that the distinctive lights on the Leonard P. Zakim Bunker Hill Memorial Bridge be turned off at a savings of less than $5,000 a month, despite the willingness of interested parties to make donations to ensure that the decorative lights remained illuminated. • Ordered that staffing levels for toll booth operators be cut to below minimum acceptable standards for periods of high traffic resulting in dangerous traffic gridlock on Easter Sunday, which unnecessarily and knowingly placed public safety in peril for the distinct purpose of creating public support for your gas tax increase proposal. • Pursued a plan to implement a big brother like tolling procedure whereby the RMV would continually track motorists and bill them for vehicle miles traveled. • Reprimanded Massport officials for proposing a $1 parking fee increase after voting as a Massport board member to designate the power to raise/lower parking fees to Massport administrators, while at the same time proposing a $2 “carbon fee” that would have been added to Logan parking rates. • Advocated for and implemented a plan at the Registry of Motor Vehicles to significantly increase license, registration and records fees. • Instituted a policy at the RMV eliminating extended and weekend hours of service. This is just a sample of the many poor policy decisions he made, but let’s not forget all of the public relations fumbles that led to an even greater mistrust of government. Lieutenant Governor Tim Murray apparently has nothing better to do than point fingers and call people names. Today, Murray said, “Listening to Charlie Baker talk about fiscal responsibility is like getting lectured on abstinence from Paris Hilton.” First of all, it’s nice to finally know exactly how Murray spends his day – checking out Perezhilton.com and reading US Weekly. However, maybe Governor Patrick’s butler should spend a little more time crunching the numbers, since it was the Patrick-Murray Administration who drove our state’s finances into the ground. 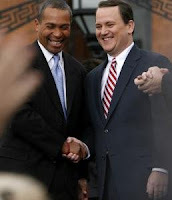 When Governor Patrick and Lieutenant Murray campaigned, they focused on changing Beacon Hill and putting partisan politics aside for the sake of the people. Apparently, that concept went out the window along with governing! Memo to Lieutenant Governor Murray – maybe you should start looking for a new job, because the people of Massachusetts are sick of paying you to surf the web and put out the occasional attack on your political foes. The Patrick Administration pulled a weekend news drop on us - announcing that the stimulus money allocated to the Bay State has created 4,722 jobs. However, as we reported here on The Capitol View, last October, Governor Patrick claimed 23,533 jobs were "created or retained" in Massachusetts, thanks to the stimulus package. So, which is it? There’s a heck of a difference between the two figures and based on the Governor’s track record, it’s hard to know what’s true and what is a dressed-up press release. What is particularly frustrating is that Governor Patrick and his administration tend to be fast and loose with numbers. For example, remember the $1 billion Life Sciences bill that Governor Patrick said would create 100,000 jobs? Well, as of right now, according to available data, only 1,000 jobs have been created. Remember just last week the Governor saying at a press conference that Massachusetts’ economy was recovering faster than the rest of the U.S. economy? According to a report only days later, Massachusetts was actually trailing the national economy in recovery. This is the grim reality of the past three years under Governor Patrick. Can the Commonwealth really afford another four?